Last season, as I reviewed and analyzed every episode of season one of Veep, I noted on more than one occasion that nothing much changed from episode to episode. 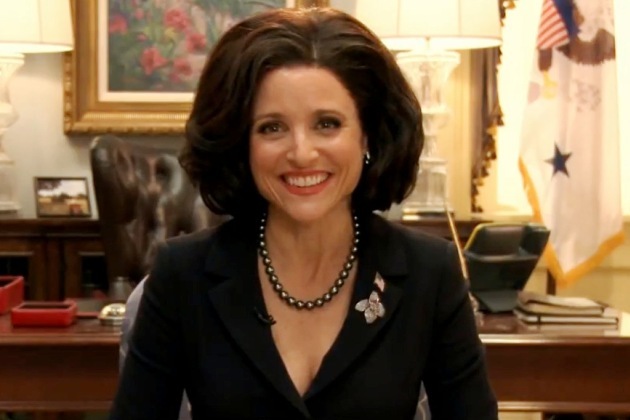 Vice-President Selina Meyer continuously strove for relevance in the political arena. She was given several substantive issues to lead on, only to see POTUS downgrade her priorities when bigger issues arose. Her staff schemed to either keep their jobs or leapfrog to a better gig, but in the end everyone ended up in the same place: the veep’s office, waiting for the president to call. Veep always had the feel of political satire, especially since its creator Armando Ianucci created one of the best political satires of the last twenty years, the great In the Loop. But I was beginning to wonder if maybe Veep was just a workplace sitcom, and the political milieu was just set dressing. A lot rested on the season two premier. Would it just be more of the same? Would these characters just keep going through the motions for season two, or would Ianucci actually find something original to say? The jury is still out on the second question, but Ianucci has cleverly flipped the script on the first season and created what should be a new source of comedy. Selina is going to have to do stuff. Whereas Season One Selina never had much to do, the first episode of season two ends by giving her a rather full plate. On the night Selina’s and the president’s party suffer a mid-term drubbing, she works the back channels, trying to spin her way into a larger role in the administration. She finally stumbles upon a piece of good news – that her campaign appearances actually proved a bigger boost to the down-ticket candidates that the president’s. And what is Selina’s reward for her sudden likeability? 30 morning-show interviews on zero hours of sleep, and a taxing foreign policy portfolio. She gets everything she wanted, and in an instant, she immediately regrets it. So Selina is miserable again, and we wouldn’t have it any other way. Julia Louis-Dreyfus plays put-upon better than any comedic actress working today, and Veep remains in her wheelhouse. The supporting characters may get more laughs – Tony Hale’s sustained hilarity bodes well for the forthcoming season of Arrested Development – but JLD is a rock steady presence of comedic despair amidst the chaos. Still, there was little political satire within the episode, and that remains a disappointment. Ianucci’s observation – that the people running the government are a bunch of dysfunctional losers just like the rest of us – remains a bit too easy. But his cast is game, the jokes are solid, and his gift for wordplay (I particularly liked “What-the-Fuckistan”) continues to reap benefits. It’s enough to keep me watching and keep me hoping it will turn into something more.